I just returned from a 5 day trip to the Northern California Coast. We stayed in B & B's in Santa Cruz and Moss Beach which allowed us to drive to Monterey, Carmel, Pacific Grove, Half Moon Bay, San Francisco, and Salsalito. The weather was wonderful, crisp and clear allowing for beautiful vistas. 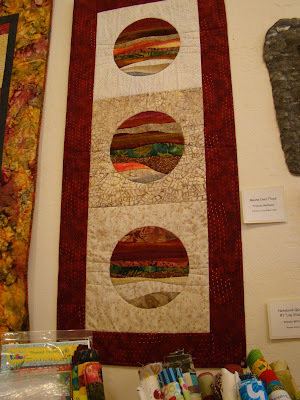 I found a gem of a quilt shop in Pacific Grove called Back Porch and of course bought fabric. The owner said they have quilters come from all over to stay and participate in workshops. We missed their quilt show by one week, Boo-Hoo. 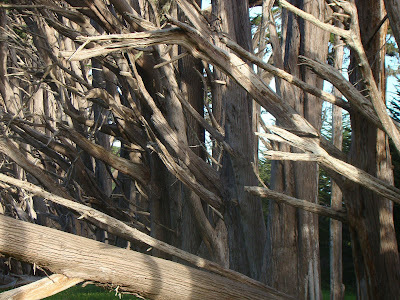 The intersecting lines of these cypress trees inspired an idea for slashing strips and reassembling to create patterns. We visited the Filoli Estate in Woodside off Hwy 280 on our way back to the San Jose Airport. The grand house and flowering English gardens were spectacular. 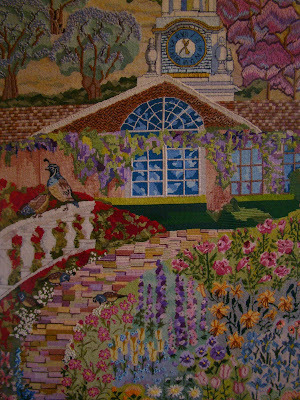 This needlepoint picturing the garden house and grounds is part of a room screen. Interlacing branches and colorful blooms give inspiration to quilt ideas. What a pretty coastline that is Janet,I also like the wallhangins with the landscape designs in the circles, very effective. 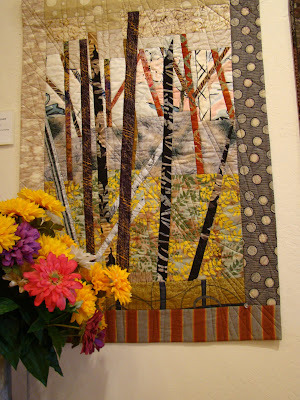 um, will you make me a quilt like the one with the trees? beautiful!